The commercial satellite industry has long been a crucial enabler of civil government functions. The U.S. Air Force is targeting 2016 as the year to outsource the operation of its Wideband Global Satcom (WGS) constellation to commercial providers. Our nation’s emergency services are lacking, when they should be leading in adopting technology innovation. With a vision to reduce costs and increase military use of commercial satellites, Rep. Michael Rogers (R-Alabama) wants long-term government leases of such satellites. The Remote Sensing Systems Directorate, at the U.S. Air Force Space and Missile Systems Center, is responsible for the acquisition activities for DoD’s Space-Based Remote Sensing needs. 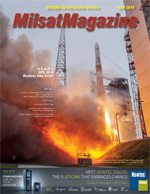 These include the Space-Based Infrared System (SBIRS) missile-warning system, Defense Meteorological Satellite Program (DMSP) and the next generation missile-warning and weather systems.